Did you see Professor Paul McGreevy on the ABC News the other day, getting stuck into the use of restrictive nosebands on equestrian horses at this year’s Rio Olympics? The crank noseband has a leveraged buckle design that can be tightly adjusted to clamp the jaws together. It is mainly used on dressage horses that refuse to keep their mouths shut. 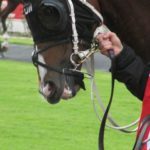 In a new study at Sydney University Paul and his team found that a tight noseband elicited an elevated heart rate and increased eye temperature, indicators of a physiological stress response. And the tight noseband also prevented the expression of various oral behaviours, such as chewing, licking and swallowing. The study has been published online in Plos One. I have long been averse to gear on a horse’s head, including noserolls and nosebands. 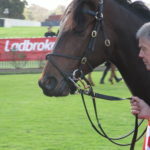 Crank nosebands aren’t used on racehorses, but the cross-over noseband is relatively common. 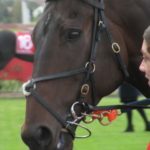 There were nine cross-over nosebands at Sandown today and one Kineton noseband. None of the ten horses were placed! 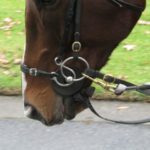 The Kineton noseband on Stand To Gain is easily distinguished from a conventional noseband by the half rings on each side, their J-like shape, and the low position of the band on the nose. You can find more discussion about them in Watching More. They are petty rare and I haven’t seen enough to give them a behavioural handicap, although of course I think they are worth opposing in the betting. 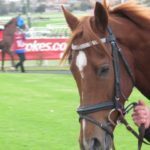 The cross-over noseband however has a definite negative effect on performance with a current behavioural handicap of 18. This simply means that horses win 18 per cent less than expected by chance. If you look carefully at the six horses in the photographs you will notice a lot of variation in design (Tip: click on the photo then click again to enlarge it). Some bands seem more benign than other, such as the rolled leather on Mr Individual and Tan Tat Charger. Others seem more heavy duty such as the one on Temps Voleur and others attempt to mitigate the impact of the band on the bridge of the nose with a woollen or plastic pad such as on Caprese and Four Carat. I oppose horses with a cross-over noseband, with one notable exception. I backed the champion horse So You Think when he showed me that it was just an irrelevant piece of gear! The change in weather at Sandown today, from Indian summer to winter, has reminded me that it is time for a break. Time to fly north to Queensland and warm up my body. Look out for a postcard from the spelling paddock. See you in the spring! Did you see where champion jockey Damien Oliver was rubbed out for a month for failing a breath test at 11.41 am on the last day of the Warrnambool jumps carnival? He blew 0.038. Fifteen minutes later this had dropped to 0.035. The limit is 0.02. He must have had a pretty good night on the tiles! But I agree with the stewards. It is risking life and limb to be riding a horse half-cut. Just remember my great-great grandfather, Caleb Crompton! Caleb arrived in Van Diemen’s Land on the Branken Moor on 4 April 1843. He was a mere 22 years old. He took up farming in the Lake River district and married Fanny Lombe one year later on 14 July 1844. The family moved to Miners Rest in 1851, no doubt lured by the discovery of gold. Caleb and Fanny’s fourth child, my great-grandmother Frances Emily Crompton, was born in 1853. Tragedy struck the family one year later when Caleb was found dead on 30 December 1854 at Dowling Forest, not far from the racecourse. A hastily organised inquest into Caleb’s death, with several witnesses, quickly established the cause of death. Charles Paine on his oath said as follows: I am at work at this house. I and another left the house at about nine this morning in the direction of the race course, and shortly before getting there we saw deceased lying on the ground on his right side with his head twisted on his shoulder. I thought at first he was asleep but on examination found he was dead. I went to the race course and gave information and enquired for a medical man. I then returned and assisted in removing the body home. I found the hat flattened in at the crown about a yard from the body. Thomas Fletcher on his oath said as follows: I am a store keeper. I have seen deceased (sic) once or twice. He left my store on the race course about half past seven last night. He was on horse back and leading another horse belonging to me. He set off in the direction for home. He appeared a little elevated (Victorian word for slightly intoxicated) but not drunk. I heard nothing more of him until this morning when I heard of his death. Deceased was alone when he left my tent. Alexander Sangster on his oath said as follows: I am deceased partner. He left home yesterday about twelve o’clock for the purpose of proceeding to the races. I saw no more of him until after he was found dead in the bush. He intended to return in the evening. Deceased horse was caught in the bush and brought home about nine this morning. Shortly afterwards I received information that deceased had been found dead in the bush. I at once went there and found the deceased lying on his back. I was told the body had been turned over in order to search the pockets. I saw two pounds and some papers that had been taken out of his pocket. The police arrived shortly after me. The body was conveyed here in a cart “by a ferryman”. Deceased was rather given to drinking. Deceased could not have had much money as I lent him some before he started. I was not concerned at the deceased not returning. I thought he might have gone to the race dinner at Ballarat. The coroner’s conclusion: Accidental death by a fall from a horse – deceased at the time being intoxicated. Caleb was just 33 years old. There are several morals to this story. 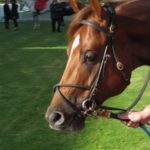 If you are a jockey – don’t drink and ride! And if you are a punter, borrowing money to attend the races is rarely a good idea. And if you have a drink at the racecourse – take extreme care on the way home.